The '58 Longhorn bass scores big on price, playability and tonal versatility. Infectious playability, a tone for every occasion, and the keen pricing make this a real contender for image-conscious bassists. The stacked control knobs have a habit of sticking together. Apparently inspired by the profile of an Ancient Greek harp called a lyre, no less, the original '58 Danelectro Longhorn Series was populated by three instruments. The model #4423 Bass, as reissued here, was accompanied by the #4623 Six-string Bass and the #4123 Guitarlin, a curious beast that pitched both guitar and mandolin sounds over its extended-length 31-fret fingerboard. The Longhorn Guitarlin achieved a measure of cult status when godfather of punk, Link Wray, was pictured with his in the late 50s. Wray devotee Pete Townshend also employed a Guitarlin on stage with The Who in 1965. The relationship came to an abrupt end when he thrust it without mercy through the front of a Marshall cabinet. So, this new '58 Longhorn Bass is a reissue of the original short scale model. The bass features Masonite (we know it as hardboard) panels concealing an internal hardwood frame. There's also cosmetic vinyl body tape, vintage-style tuners, well-cut aluminium top nut, 'Coke bottle' headstock, lipstick-cased single-coil pickups and concentric or 'stacked' volume and tone controls. Also we get the original-spec wood saddle, along with maple necks which are secured to their bodies with four large screws. Back in the day, you only got three, set in a straight line. The Longhorn body shape isn't all about show. The extended horns provide decent balance when the instruments are hanging from a strap, while the deep cutaways promote good upper fret access, compromised only slightly by the chunky union between the body and neck. Playability is superb thanks to a shallow D neck profile and a 355mm (14-inch) fingerboard radius. The frets are described as medium in the sales literature, but in reality feel a mere junk-food binge away from fat, which makes for fluid string bending. 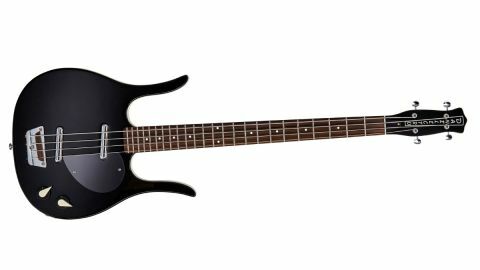 The Longhorn bass shares the inherent brightness of its six-string brother, enhanced further by its round wound strings. Vintage buffs would be advised to dampen down the brightness with a set of flatwounds. The Longhorn doesn't quite match the bottom end thump of a P-Bass but it'll handle any situation you throw at it. John Entwistle of The Who famously beat his way through three Longhorn basses trying to record his solo on My Generation. As it happens, adding some gain to the bridge pickup gets pretty damn close to his later Quadrophenia sound.